After an almost 6 year sabbatical, Jerry is now offering personalized one-on-one and small group photography instruction and guiding services. 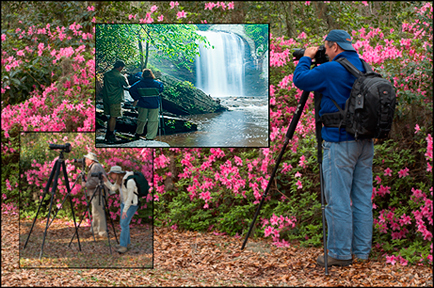 This service is perfect for small groups or individuals interested in customized photography instruction and/or specialized photographic location guiding. Guiding services in southeast and mid-Atlantic locations like Great Smoky Mountains National Park, Shenandoah National Park, Blue Ridge Parkway, Western North Carolina, the Up-State of South Carolina, and North Georgia Mountains are his specialty. But Jerry also offers guiding services along the coastal regions of the Carolinas, including the Outer Banks and Cape Hatteras National Seashore and the coastal regions of South Carolina. Other locations are available as requested. Not only is Jerry an internationally acclaimed nature and environmental conservation photographer, he has been in the book publishing industry for more than 10 years. Jerry is Founding Partner of Mountain Trail Press, a publisher of natural history books and calendars. He is now offering instruction and consulting services for aspiring photographers interested in self-publishing or the publishing industry, which includes all aspects of the design and the printing process and publishing business. Please contact Jerry to discuss consulting services and/or private instruction by clicking here or by calling 423-335-8245.